I join the Royal Army Ordnance Corps on the 12 December 1940 and learnt army ways and techniques at various depots. 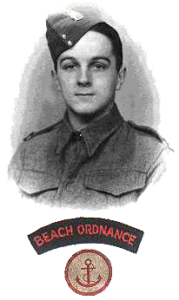 The unit was mobilised in Aldershot in October 1942, Number 11 Beach Ordnance Detachment. We all landed safely on the beach codenamed SWORD at intervals on D-Day. Our commitment was to supply the 3rd British Infantry Division and the 6th Airborne Division with ammunition and later stores and spares. I had embarked at Hardway, Gosport on an LCT, my job being to take the only truck containing all the unit’s appurtenances. I was the last man to land. A spare seat had been allocated to an Airborne Ordnance Officer, who upon landing insisted that we stopped to rescue a black cat, perhaps a lucky mascot. I eventually delivered the Officer and the black cat to Pegasus Bridge and returned to the beach very swiftly. Four ammunition dumps were established a short distance from the actual beach; only one suffered from destruction. After a few days we moved forward to establish larger ammunition and store dumps. Our work was virtually completed after five weeks, but we did not return to the UK. Instead we continued to supply 30 Corps, and finished our war near Hamburg.